Angad Daryani, a 15 year old school dropout is working on building low cost 3D printers in India. Angad Daryani who calls himself a 'maker,' is building 'Sharkbot'- a low cost 3D printer that he plans to sell in India. The 15 year genius built his first robot when he was just 8 years old and at 13 he started building his own versions of the open-source RepRap 3D printer. Angad was hired by IIT Bombay last September to work with doctoral researchers who were building a 3D printer and has since then branched out on his own. He plans to begin marketing his Shark-Bot range of printers at a price as low as Rs 20,000 in the next 2 months. 3D printers imported in India generally cost between Rs 2.5 lakh to Rs 10 lakh. Daryani's products will be retailed by a computer peripherals business run by his father, Kunhar Peripherals. Daryani says that he wants the printers to be used by schools. He has also created Virtual Brailler, an e-book reader for blind people which can convert written text to braille as it scans across a text. 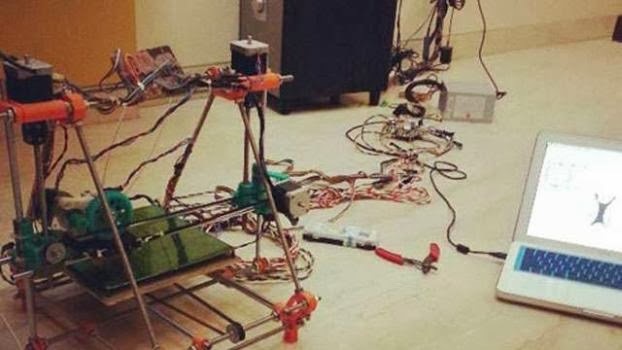 Shai Schechter, a college student from Purchase College, State University of New York, has also developed a new affordable 3D printer called the Deltaprintr that costs $475. He built a printer made of plastic that costs less than one third of the traditional 3D printers. He launched a kickstarter campaign, along with his free friends, to bring the low cost 3D printer for the masses.